The Red Dragons London meet for every match and for special events at our Stammlokal, the Bavarian Beerhouse in Old Street. Here in our lair the Red Dragons gather the breathe fire at our special Stammtisch – a table reserved for fan club members. Naturally, this is off limits to those from the blue side of Munich and certain unmentionables from the Ruhrpott. As you enter the Beerhouse and turn the corner you won’t take long to find the Red Dragons’ home – just follow any one of the FC Bayern shirts and you will find your way to our wonderfully decorated Stammtisch! There’s no need to hang around the bar to buy a drink… Just join us at the table, and one of the fantastic staff members will arrive to take your order! The Bavarian Beerhouse is the official partner of Red Dragons London. The restaurant hosts our Stammtisch and shows every match of our beloved team FC Bayern München! Founded in 2004, the Bavarian Beerhouse is the UK’s only German Restaurant an Bar chain offering an authentic German experience with a variety of drafted ice cold beers served in huge stein glasses, accompanied by hearty Bavarian food and Oompah-Tainment in both London and Bristol. 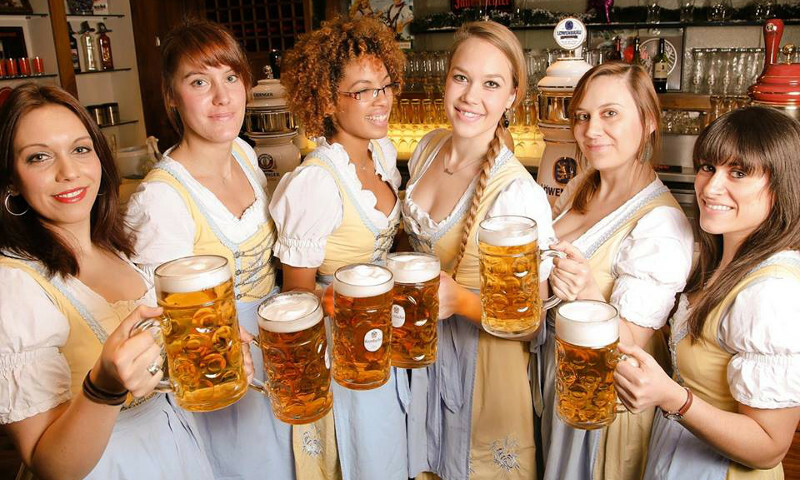 Table service is provided by charming waitresses and waiters in traditional Bavarian attire (Dirndl and Lederhosen). 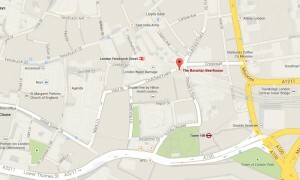 There are in fact two branches of the Bavarian Beerhouse in London, both of which serve as lairs for the Red Dragons. Our main base is the City Road branch located near Old Street tube station, while you can find us at the branch just around the corner from Tower Hill tube for Sunday afternoon Bundesliga matches. 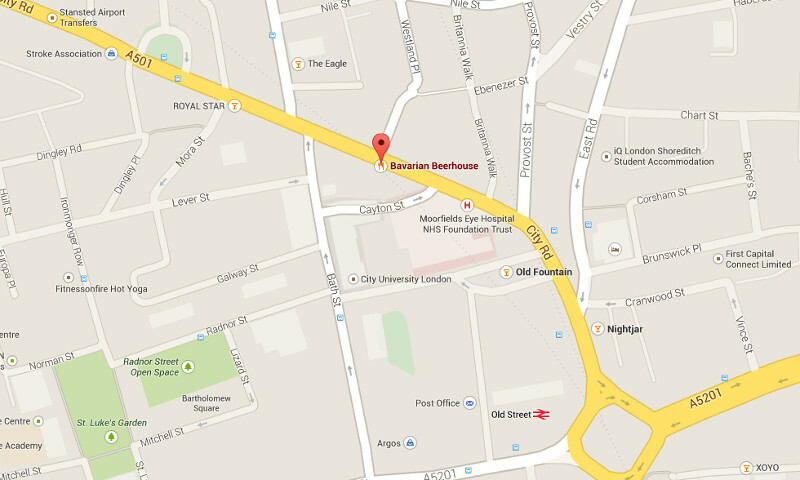 The Old Street branch of the Bavarian Beerhouse is a short walk away from the tube station, which is on the Bank branch of the Northern line. When exiting the tube station, carry on straight ahead to the exit, where you will see signs for Moorfields Eye Hospital. At the exit take the flight of stairs out onto the street to your right, you just follow the path ahead. After passing the hospital, you will see the entrance to the Beerhouse on your left. Just walk down the stairs and look for anyone in an FC Bayern shirt, who will give you a warm Red Dragons welcome and show you to the Stammtisch! 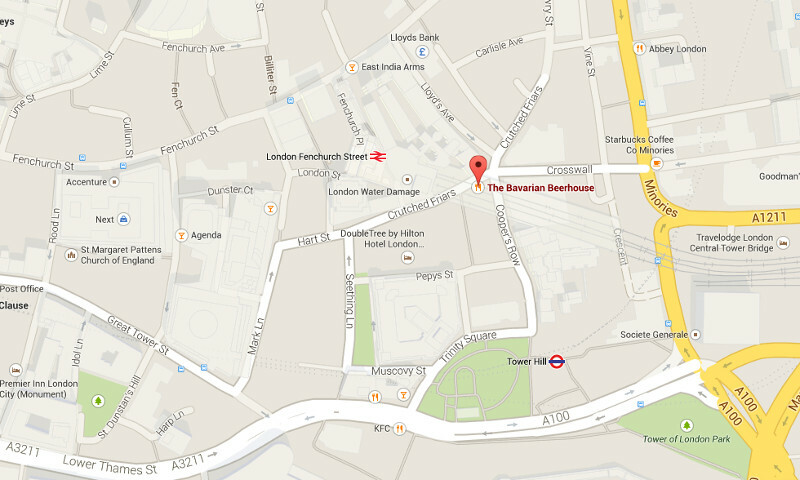 The Tower Hill branch of the Bavarian Beerhouse is located just around the corner from both Tower Hill tube (Circle and District lines) and Tower Gateway (DLR). On exiting either station, simply follow the signs for London Fenchurch street station, which will take you up Coopers’ Row. 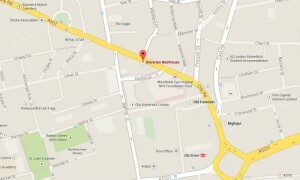 The Beerhouse is located at the corner of Coopers’ Row and Crutched Friars, and is immediately recognisable from the street. You will find the Red Dragons’ Stammtisch in the middle of the restaurant by the television – but you’ll probably hear us first!